18 Months - $66.99 Only 6 left! Small (5-6) - $66.99 Only 2 left! Haven’t you herd? Sometimes being a horse is more fun than being a real boy. You get to run around wild and free all day, eat as much as you want, and feel the breeze in your mane. So would you rather be a horse than a kid, yay or neigh? Make playtime or Halloween extra fun with this Toddler Corduroy Horse Costume! 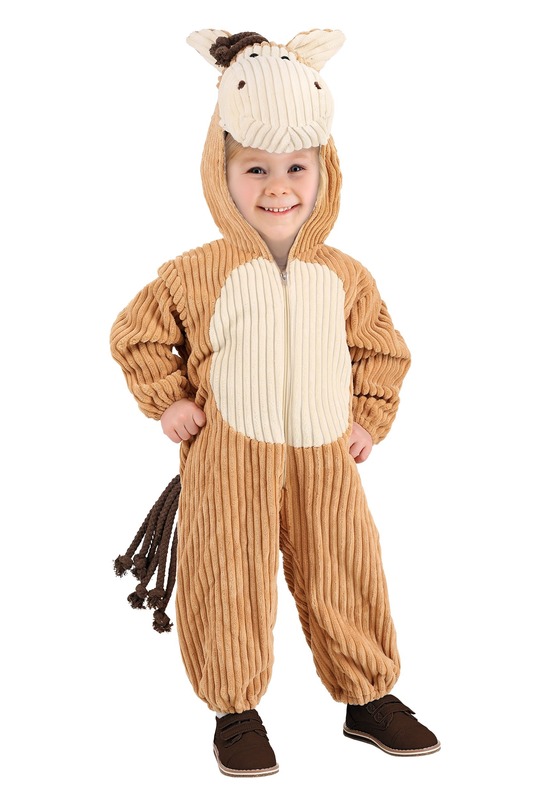 Let your little stallion roam the plains of your backyard in this number and we bet you won’t be able to take your eyes off of him as jumps over obstacles and hoofs it around the fence line. He’s also bound to rack up some extra candy in his trough at Halloween as he trots about the neighborhood trick-or-treating. That’s because this look is so stinkin’ precious, the folks handing out candy won’t be able to resist him as he paws the ground for more. And can you blame them? Of course you can’t. No one can resist his little face as it peeks out from under the plush hood of this zippered corduroy jumpsuit. So it’s a good thing your little foal is too young to make heads or tails of all the newfound power his ears and tail bestow upon him. He’s too busy galloping through the green grasses of life to abuse it.